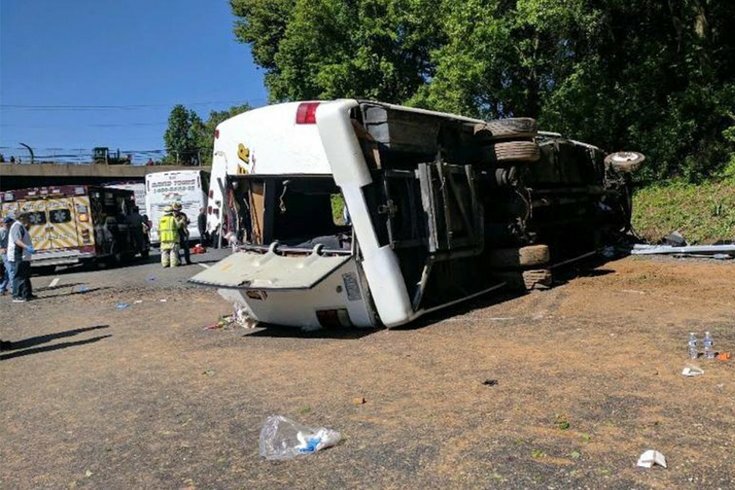 A limousine-style bus carrying Philadelphia schoolchildren on a school trip lies on its side in the center of the southbound lanes of I-95 in Havre de Grace, Maryland. At least two dozen Philadelphia schoolchildren were injured after their charter bus overturned on I-95 in Maryland on Monday morning. Twenty-six children, two teachers, one chaperone and a driver were on board in the crash that occurred in the southbound lanes, School District of Philadelphia Superintendent William Hite said. All the passengers were taken to five area hospitals, including two who were flown for treatment by helicopter. No fatalities have been reported. One student was airlifted to Alfred I. duPont Hospital for Children in Wilmington, Delaware. A teacher was airlifted to the University of Maryland Trauma Center. Hite said both were "critically injured" in the crash, but declined to provide their identities or elaborate on their conditions. The bus, carrying eighth-grade students from the C.W. Henry School in West Mount Airy, was headed to Washington D.C. for a class trip. Hite, at an afternoon news conference alongside Mayor Jim Kenney, said the district had contacted most of the parents and guardians of the students. Administrators were still trying to connect with several others. Parents of all the students on the trip are encouraged to call (215) 400-5858 for information. "Our thoughts and prayers are with everyone involved in this incident," Hite said. The district has established C.W. Henry School as a "reunification center" where many students will be able to unite with their parents later today, Hite said. Additional support staff have been sent to the school to provide counseling and meet other needs. The American Red Cross and Salvation Army also are on site at the school, which will remain open all night. Administrators were en route Monday afternoon in a bus to be in place at each of the hospitals and transport any students discharged from the hospitals. 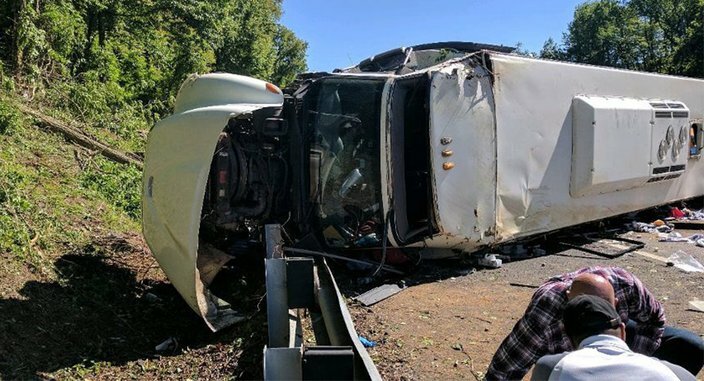 Maryland State Police said a preliminary investigation revealed that the driver of a passenger car, a Maryland resident who was not identified, was attempting to pass around the bus on its left by moving into the fast lane. For unknown reasons, the driver lost control of his vehicle and careened off the left side of the interstate before returning, crossing all three lanes of traffic and clipping the front of the bus as it crossed ahead of it. Once hit, the bus traveled off the right side of the interstate, striking an embankment and a tree before flipping on its left side. The bus ultimately came to rest in the slow and middle lanes of the interstate. State police spokesman Greg Shipley told WJZ there was also another bus – right behind the students' bus – carrying recruits from the Philadelphia Police Department to Washington for Police Week activities. The recruits stopped and assisted at the crash scene immediately, he said. Prelim info re SB I-95 @ ext 89 bus crash - 26 children, 3 chaperones, 1 driver on board. One adult, one child flown by @MDSP & De SP. The Harford County State's Attorney's Office, in consultation with state police crash investigators, determined charges will be withheld at this time. A state police investigation will still be sent to the State’s Attorney’s Office for review and a determination of what if any charges will be filed. A limousine-style bus carrying Philadelphia schoolchildren on a school trip lies in the southbound lanes of I-95 in Le Havre, Maryland on Monday. One child and one adult were airlifted to area hospitals for treatment of serious injuries, according to media reports. The Baltimore Sun reported the crash happened around 9:30 a.m., closing all lanes of the highway. The northbound lanes were reopened about 10:30 a.m.; the southbound lanes reopened about 2:20 p.m. The bus was operated by Werner Coach of Phoenixville, Chester County. A company spokesperson told the Sun it was still gathering information about the bus and incident.